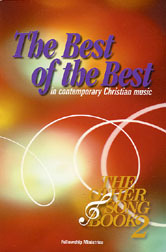 Has 253 songs compiled and edited by Rev. Mike Zehnder, Vice-President of Fellowship Ministries, Tempe, AZ. Song texts are rich in the theology of Jesus and the cross. In addition to great songs of praise and worship (many verbatim or paraphrased from Scripture), songs for communion, baptisms, weddings, funerals, anniversaries, installations, and ordinations are included. There are 55 pages of indexes. Every book in the Bible is referenced in the Scriptural index. Other indexes include topical and keys and tempos. All songs are arranged in singable keys. The Full Music Edition is printed "landscape style" to minimize page turning. Most songs are covered by CCLI; copyright information is provided for all songs including those not covered by CCLI. Full Music Edition, spiral bound, 9" x 12", 392 pages. A Lead Line version for guitarists. Spiral bound for easy page turning. Lays flat for readability and convenience. Great for leaders and pastors of small groups. 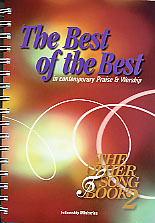 Pew Edition, melody line, chord, lyric, 6" x 9", 480 pages.